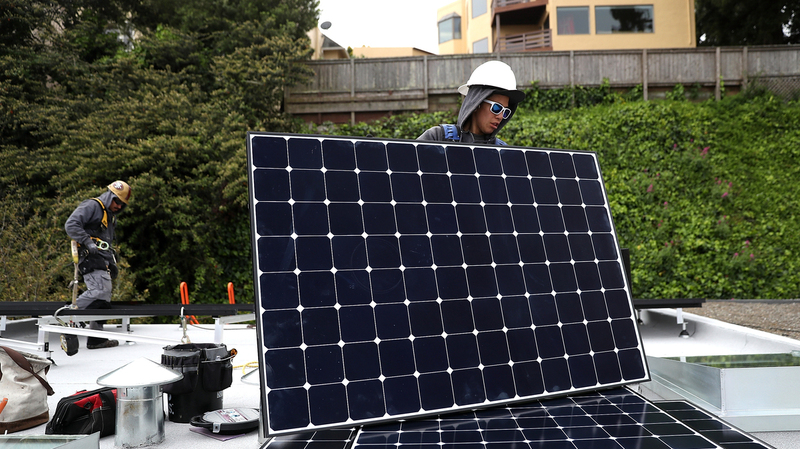 California Moves Forward With Plan To Require Solar Panels On New Homes : The Two-Way The state is poised to become the first in the country to require the panels on new single-family houses, with a few exceptions. The mandate will kick in as of 2020. Luminalt solar installers Pam Quan (right) and Walter Morales (left) install solar panels on a roof in San Francisco on Wednesday. The California Energy Commission approved a regulation that would require all new homes in the state to have solar panels. A state board in California has approved a proposal to require solar panels on all new homes beginning in 2020, a measure that would increase the cost of new construction but provide savings on utilities — and help the state meet ambitious targets for reducing greenhouse gas emissions. California, which is routinely a leader in environmental regulatory efforts, would be the first state in the country with such a requirement. Several cities, including San Francisco and South Miami, Fla., have residential solar panel requirements. The new rule in California would cover all low-rise residential buildings, although houses that are frequently in the shade are exempt. It applies only to new construction. The California Energy Commission approved the new regulation on Wednesday; the Building Standards Commission still needs to approve it, The Associated Press reports. "Representatives from construction groups, public utilities and solar manufacturers all spoke in support of the plan, which they've helped the commission develop for years," the AP reports. "No industry groups spoke in opposition." "But Republican legislative leaders argue Californians can't afford to pay any more for housing in the state's already extremely expensive market," the AP writes. A report commissioned by the state found that the requirement will have an average upfront cost of $9,365. Utility savings will balance out that cost over the long term, but the higher sales point will still hurt developers, real estate agents and some homebuyers. California has some of the highest housing costs in the country and has a widespread housing shortage. Also, because of the way California calculates electric bills, increasing the number of solar panels in the state might hurt other ratepayers by causing their bills to go up. Net metering allows consumers with solar panels to get credit for the electricity they produce, lowering their utility bills. But they're still connected to the grid — and the costs of maintaining that grid don't go down. How much this hurts other users is disputed, and varies by location, but California's energy commission says it could conceivably cost other ratepayers money. One back-of-the-envelope calculation estimates an increased cost of $65 per customer per year. But overall, making solar panels mandatory will be cost-effective, the report found, and is the only currently feasible way for the state to fulfill its goal of making new homes produce as much power as they consume. On the same day that the California Energy Commission approved the new regulation, the state EPA released a new report into the consequences of climate change in California. The report found retreating glaciers, dying trees, warming waters and devastating droughts and wildfires are tied to global warming. But the researchers noted a bright spot — the state's greenhouse gas emissions are declining, despite a growing population. The report credits California's "pioneering policies" designed to cut emissions. "Making California homes more energy-efficient is part of a broader initiative to shrink the state's greenhouse gas emissions 40 percent below 1990 levels by 2030. "Electricity consumed by residential and commercial buildings is responsible for 14 percent of the state's greenhouse pollutants, according to the California Public Utilities Commission." "Alex Steffen, who writes about sustainability and urban planning, said the state's biggest climate challenge is the fact that Californians drive so much. Transportation emissions are 40% of the total — twice as much as electricity generation. "He worries that the requirement to put solar panels on every new house could make it harder to increase housing density in cities and near public transit, which he says would have a much bigger effect on emissions reductions.
" 'Because of the lack of density, people are forced to drive everywhere. You need a car. Until we tackle that problem, doing things like requiring solar panels on new construction is a band aid,' he said." Meanwhile, utility companies tend to advocate for large-scale solar operations instead of rooftop power, arguing that "solar farms" allow customers to get solar power while advantages of scale reduce the cost.